The ‘Father of Globalisation’ looks at the life of a key figure in the global economic history of the 20th century at the very time when he faces his biggest ever challenge – the global migration crisis. 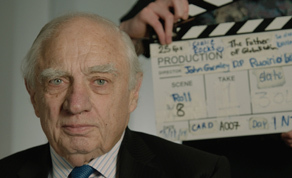 Irishman, Peter Sutherland is in the inner circle of world leaders from prime ministers and presidents to the Pope, and yet he remains unknown to many. He has had a distinguished political and business career, heading up some of the world’s biggest corporations. He has never done an in-depth interview, much less a feature documentary. Until now.